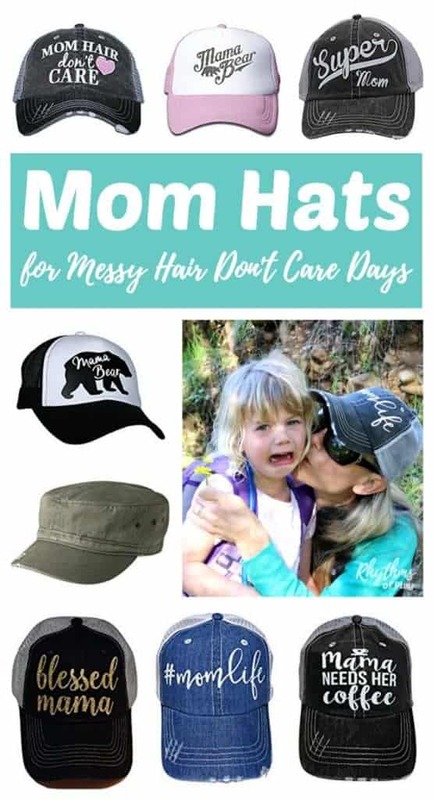 Nothing beats the simplicity of putting on a super cute mom hat for messy hair don’t care days. The fact that hats are a great way to protect your skin from the sun’s damaging rays is another great reason for mom to wear one. Every time I’m out and about I get asked where I get my fun mom hats. Now I’m sharing my favorites with you. Any one of these would make a great gift idea for Mother’s day. You may also like favorite things gift ideas for mom or this collection of super cute tank tops and t-shirts perfect for mom. This post contains affiliate links. Thank you for choosing to support this blog! 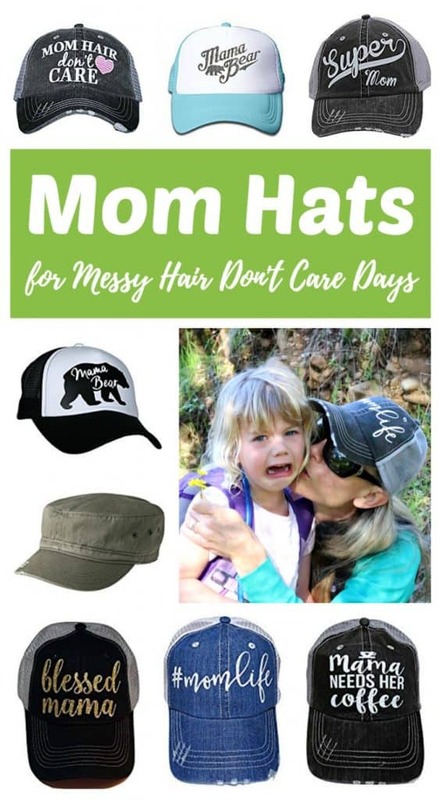 Let’s start off this fun collection with this super cute mom hair don’t care trucker hat. It also comes in a style with a blue heart. This #momlife hat is my favorite hat right now! I’m wearing it in the photo above. A real moment my husband took of me comforting my daughter. Another one of my all time favorites that I get TONS of compliments on is this olive cotton army cap. It also comes in camo, black, khaki, and brown. I put this Happy Camper hat on when I’m having one of those days. It usually snaps me out of it. How can I wear it and not be happy? It comes in teal, hot pink, coral, brown, and navy pictured below. So many of us moms could use one of these mama needs her coffee hats to let everyone know to steer clear. I would love to add one of these mama bear trucker hats to my collection. It also comes in black and pink. Another super cute mama bear hat comes in black and white and hot pink and white. Are you lucky enough to have the world’s best mom? Get her this hat! It comes in black, navy, khaki, pink, and red. Here’s a fun baseball mom trucker hat. One of these would be perfect for sitting in the stands cheering on the kids. Not a baseball mom? How about softball mom, basketball mom, football mom, or soccer mom? Or you can get this hockey mom hat in black, mint, pink or red, eh? How about this Dance Mom trucker hat that you can get in gray or black? Maybe mom has been blessed with all boys and needs a Boy Mom hat. This Fit Mom hat would make a great gym or running hat for mom. Maybe it will even motivate her to get out the door. At the end of the day, every Mom is a Super Mom! Even if we are a HOT MESS! It also comes in olive green with gold writing. Hot mess or not, we are the Wife. Mom. Boss. Also available in black or gray. No matter what kind of mom your mom is, we are all blessed mamas. T his style comes in silver, pink, or gold writing. Another style comes in green, pink, blue, and black with gray. They are also available in the washed gray trucker hat style with white writing. Next time you’re having one of ‘those mornings’ throw on one of these fun hats so you can fly out the door quickly and easily. I have a stash waiting by the door ready to go right next to the car keys. Any one of these would also make a great gift idea for Mother’s Day. You may also like this collection of super cute tank tops and t-shirts perfect for mom, or favorite things gift ideas for mom.